In the bowl of a kitchen mixer, such as a Cuisinart, fitted with a paddle attachment, add the butter and sugar and beat on high, scraping down the sides as needed, until pale yellow and fluffy, about 1 minute. Add the cinnamon, egg yolk and vanilla and mix well to incorporate. With the mixer on low, add the flour, hazelnut flour and salt. Mix to incorporate but be careful not to over mix. Divide the dough in two equal pieces and form each into a flat disk. Wrap in plastic wrap and refrigerate for 1 hour. Once the dough has rested, remove from the refrigerator and allow to warm up for a few minutes. Line two baking sheets with parchment paper and set aside. On a well floured work surface, roll out one portion of the dough until it is about 1/4-inch thick. Using a fluted 2 1/2-inch round cookie cutter, cut out as many cookies as possible. Carefully place on one of the prepared baking sheets. Repeat until you have about 18-20 cookie cutouts. Place this sheet pan in the refrigerator to rest while you work with the second piece of dough. Roll out the second piece of dough as you did the first. Use the same 2 1/2-inch cookie cutter, but also use a second smaller 1 1/2 cutter in the center. These will be used as the tops and will allow for the jam to be visible once assembled. Carefully transfer these to the second prepared baking sheet. Place in the refrigerator and allow to rest for 30 minutes. Remove both trays from the refrigerator, place in the oven and bake for approximately 8 minutes until you begin to see just a touch of coloration around the edges, rotating once halfway through. Remove from the oven and allow to cool completely. Once cool, use a dusting wand or sifter to dust the cookie tops generously with confectioners sugar. Set aside. Carefully turn the bottom cookies over so the flatter side is now on top. Place about 1/3-1/2 a teaspoon of cherry preserves on the cookie and smooth out evenly. 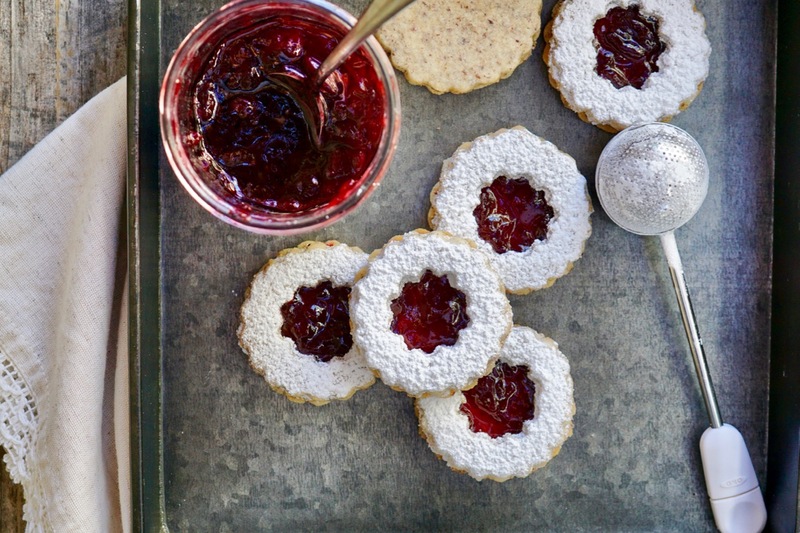 Gently place a sugar-dusted cookie on top of the jam-layered cookie, making a jam sandwich. Repeat with the remaining cookies. 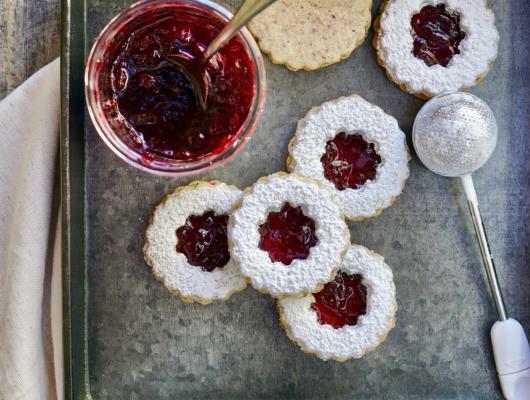 Rich buttery, hazelnut-cherry linzer cookies just in time for Christmas.